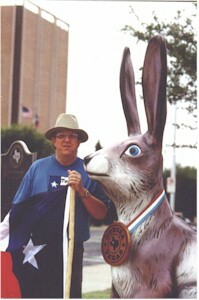 The big jackrabbit has been a fixture in Odessa for years. 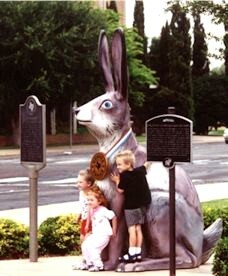 On the day I last visited this landmark a station wagon with Kansas plates pulled up with the expressed purpose of photographing their children with the rabbit.Some twenty years ago I attempted to take a picture of my own daughter with the big rabbit but she was too scared of it to get close enough to take the shot.If you would like to take a picture with the Rabbit it's located at Eighth Street and Sam Houston Avenue in Odessa, Texas.Unlike most attractions there are rarely long lines. Contest began as a "Hare Brained" publicity stunt during 1932 annual Odessa Rodeo held at 3rd and Grant Street site despite objections from out of town do-gooders. Local sheriff opposed event but mayor and judge no violation of Texas law. Cow girl Grace Hendricks roped rabbit from horseback in five seconds flat winning over numerous male competitors. Revived in 1977 causing coast to coast outcry. Midland animal lover delayed action by liberating captive jackrabbits. Event preceded on schedule when former prisoners returned at feeding time. Seven ropers competed on foot. Jack Torian placed first with a six second scamper. In 1978 human society blocked all future ropings with a court order. True plains rabbit lives only in the west. Burro like ears gave him his name. Color is protective, blending with the sand and dry grass. Very long legs make him a swift runner clocked at speeds to 45 miles an hour object of hunts with greyhounds. Was prized by plains Indians for food and fur to white man a reminder of desert-hard life in drought and depression meat source for thousands. Subject of tall tales actual hero of world's only jackrabbit rodeo in Odessa, May 1932.